California’s Secretary of State office will be sending monitors to San Francisco to oversee Tuesday’s election, a spokeswoman said today. 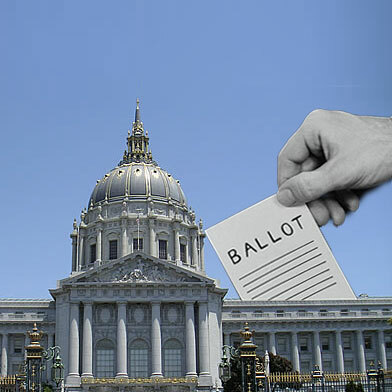 State oversight of the election was requested by several mayoral candidates following allegations last month that an independent group supporting interim Mayor Ed Lee engaged in voter ballot fraud in the city’s Chinatown neighborhood. Winger declined to say how many monitors would be sent, but said they would work in coordination with the local elections office and will visit various polling places around the city. San Francisco is the only jurisdiction where the state monitors will be sent this year, Winger said. She said San Francisco was also among 12 counties where observers were sent in last November’s statewide election. The letter requesting oversight for this year’s race came after members of the campaign of state Sen. and mayoral candidate Leland Yee took videos that appeared to show a group helping elderly voters fill out ballots at a makeshift polling station and alleged that the group was using stencils to guide voters to mark Lee for mayor. Yee said in a statement that he welcomed the monitors. Matt Dorsey, spokesman for the mayoral campaign of City Attorney Dennis Herrera, said they too were pleased to have additional oversight. Winnicker said Lee’s campaign has dozens of volunteer lawyers who will also be monitoring the election, particularly in predominately Chinese voting precincts where the campaign has alleged voter suppression and intimidation efforts by Yee’s campaign. Polling places will be open around the city from 7 a.m. to 8 p.m. Tuesday. Along with the mayor’s race, voters will decide on a district attorney and sheriff, as well as several propositions.